A strengthening Tropical Storm Arlene moved northward Friday through the Gulf of Mexico, drenching western Cuba before bearing down on the U.S. Gulf Coast — a region still recovering from last year's hurricanes. While Arlene is the first named storm of the Atlantic hurricane season, the memories of last season are still fresh for Floridians, reports Carey Codd of CBS Station WFOR from Pompano Beach, Fla. Arlene's early rain bands arrived as a warning of the season ahead. High winds whipped waves along popular beaches with dark clouds threatening the storm to come. Residents from Florida to Louisiana are now being warned to stay alert. Tropical storm watches were posted from Florida to Louisiana for Arlene. It had top sustained winds of 55 mph, up from 45 mph earlier in the day, but forecasters said the biggest impact would be heavy rain. Arlene may not come close to that fearsome foursome that battered Florida last year, the state's hard-hit west coast remains a target, Codd reports. The biggest concern is for people who might be in vulnerable housing. The downpour that landed on Havana and the rest of western Cuba as Arlene passed the island's westernmost tip early Friday was welcome relief from the island's severe drought. Flooding was possible, meteorologists said, and some schools were closed, but there were no immediate reports of damage or injury. Arlene was expected to make landfall in the United States around midnight Saturday, most likely somewhere between eastern Louisiana and the western Florida Panhandle, with the worst weather east of the storm's center. Though the storm was not expected to strengthen into a hurricane, it could drop 5 inches of rain or more and cause tornados in southwestern Florida and the Florida Keys, meteorologists said. Beach erosion was also possible. "This is going to be a major rainfall event before and ahead of the storm," said Trisha Wallace, a hurricane center meteorologist. In Homestead, Fla., where hurricanes have been known to hit like a curse, people know how to prepare, Codd reports. "We have our shutters, we have our supplies, so we'll be fine," said Elaine Padilla. They are even stocking up on supplies in Alabama, Codd added. At 8 a.m. EDT, Arlene's poorly defined center was about 50 miles north of Cuba's western tip. 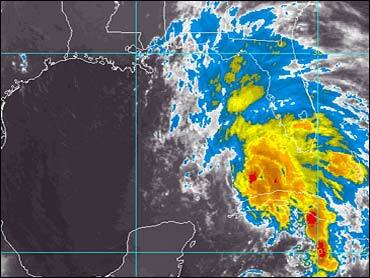 The storm was moving north-northwest at about 10 mph, the National Hurricane Center in Miami said. Wind and rain extended 140 miles to the north and east from the storm's center. Ahead of the storm, steady rainfall and squalls began to hit Florida on Thursday. A tropical storm warning was also in effect for the Dry Tortugas, a cluster of islands about 70 miles west of Key West that are a U.S. national park. The Panhandle was battered last year by Ivan, one of the four hurricanes to strike Florida in the space of a few weeks. State meteorologist Ben Nelson warned coastal residents that flooding patterns could be different now "because the dunes, the offshore structures, have been changed around by Ivan." Hurricane season began June 1 and ends Nov. 30. In addition to Ivan, Florida was struck by Charley, Frances and Jeanne. The storms caused about 130 deaths in the United States and are blamed for $22 billion in insured damage.